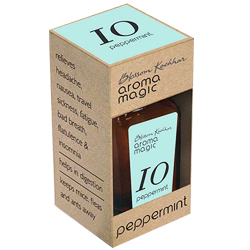 Buy Aromamagic Peppermint Oil for Asthma, colic, exhaustion, fever, flatulence, headache, nausea, scabies, sinusitis, vertigo. Relieves Headache, Nausea, travel Sickness, fatigue. Bad Breath Flatulence and Insomnia. Helps in Digestion keeps mice fleas and ants away. Asthma, colic, exhaustion, fever, flatulence, headache, nausea, scabies, sinusitis, vertigo. Minty, reminiscent of peppermint candies, but more concentrated. More fragrant than spearmint. Relieves cough, catarrh, bronchitis, sinusitis. Helps treat migraines, painful periods. Anti-inflammatory, relieves congestion, insect repellent. A cooling and invigorating oil. One of the best remedies for all digestive orders and nausea. An excellent alternative remedy to aspirin - 2/3 drops taken internally on a spoonful of honey. Helps to alleviate migraine. Very effective insect repellent.